You'll be £20.00 closer to your next £10.00 credit when you purchase The Giant Otter. What's this? The aptly named giant otter is exceptionally well adapted to life in rivers, lakes and wetlands in tropical South America. Known in Spanish as lobo del rio or 'river wolf', it can be as long as a human is tall, and is the most social of the world's thirteen otter species. Each individual is identifiable from birth by its pale throat pattern, as unique as your fingerprint. Giant otters are top carnivores of the Amazon rainforest and have little to fear... except man. There are many reasons why scientists and tourists alike are fascinated by this charismatic species. Spend a day in the life of a close-knit giant otter family and you’ll realise why. Learn about their diet and hunting techniques, marking and denning behaviour, and breeding and cub-rearing strategies, including shared care of the youngest members. Become familiar with the complex life histories of individual otters over their 15-year lifespans. And accompany a young disperser during the trials and tribulations of a year spent looking for a mate and a home of its own. Although giant otters have few natural enemies, they became the target of the international pelt trade in the 1940s, and by the early 1970s had been hunted to the brink of extinction. Today, illegal hunting is a minor hazard. So why is the giant otter still endangered? Find out about current threats to the species and discover how a variety of conservation actions are benefiting the otters over the last decades. Then be a part of the solution by acting on the steps we can all take to help further giant otter conservation. Jessica Groenendijk’s love for giant otters and their Amazon waterways makes her book, The Giant Otter, one of the finest on an animal species I have discovered. The author’s expertise in field observation and research are clear in the writing that is at once informative and accessible. Excerpts from her personal experiences and field notes strengthen the narrative even more. The color photographs are more than beautiful portraits of otters and native wildlife; they join with the writing to tell the whole story of the giant otter. Early in the book we see the giant otter’s great size –he’s as long as we are tall-- and his fluid motion in the water, his strong, webbed hands that grip fish, and bright, inquisitive eyes, whiskers, little ears, and his mouth that is so expressive, especially when vocalizing. How could anyone not fall in love with these beings? Through the author’s eyes, we come to know who giant otters are. 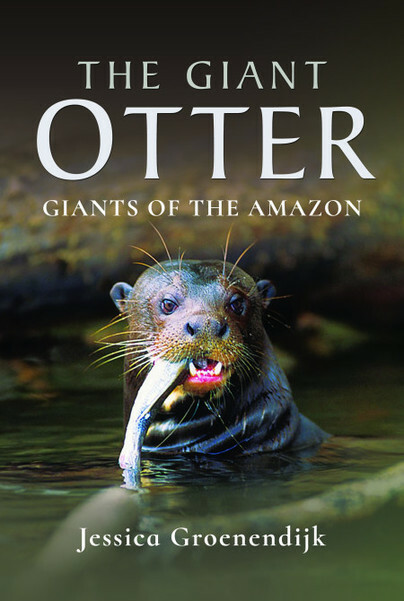 Jessica Groenendijk is both a scientist and a nature writer, and in The Giant Otter: giants of the Amazon she delivers a wonderful blend of these two disciplines. Her account of the lives and ecology of her study species is authoritative and unsentimental - as though she wouldn't dream of romanticising - and yet the charisma of these huge, Amazonian 'river people' burns through even the most factual descriptions, emphasised by an abundance of photographs. The real joy is in the inclusion of extracts from Groenendijk's field notes - they provide an insight into a truly enviable day job in the most biodiverse terrestrial ecosystem on Earth.